The track is laid on fom risers. Here it has been covered with blue masking tape to protect it from stray plaster and pait. 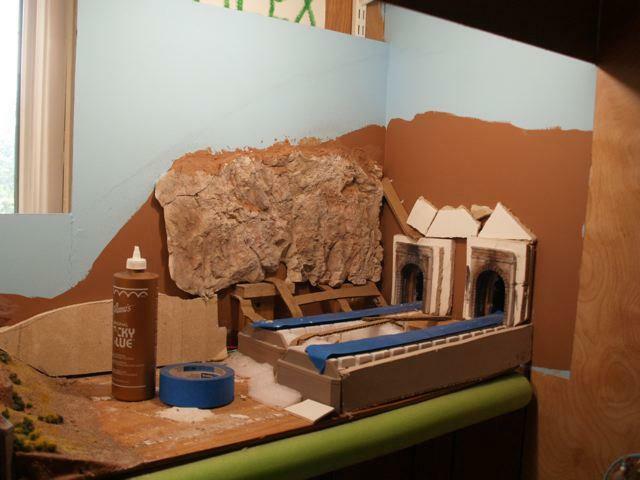 A masonite backdrop was attached to the walls and painted light blue and brown where I plan to put the cliff walls. 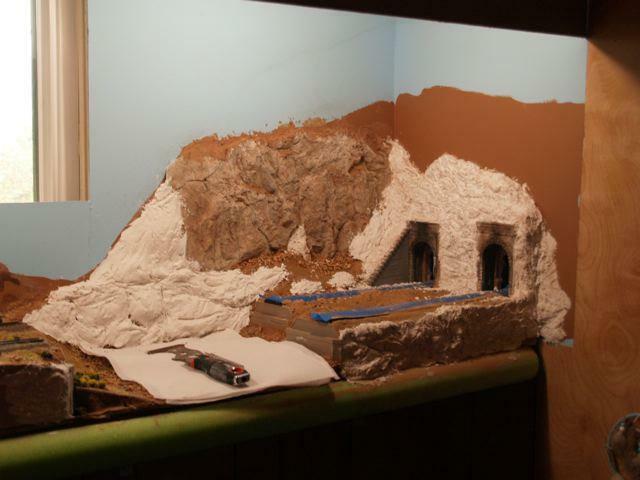 I glued a big rock casting on the backdrop to form the cliff face of the side of the canyon. Cardboard strips have been glued into place to represent the land forms. 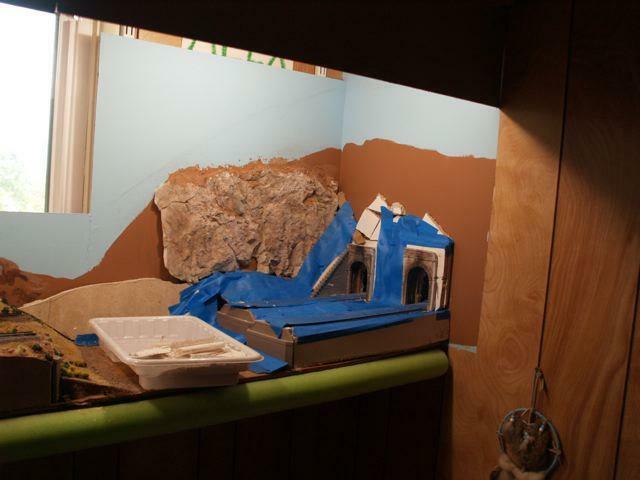 Pieces of foam and bits of ceiling tile are also used to build up the land. Two tunnel portals made of cast plaster are glued in place. Masking tape is used to fill in between the cardboard and form the "ground". I cover the tape with plaster cloth (Woodland Senics) dipped into water. I put on two layers minimum. the plaster cloth is in place and now it is left to dry. 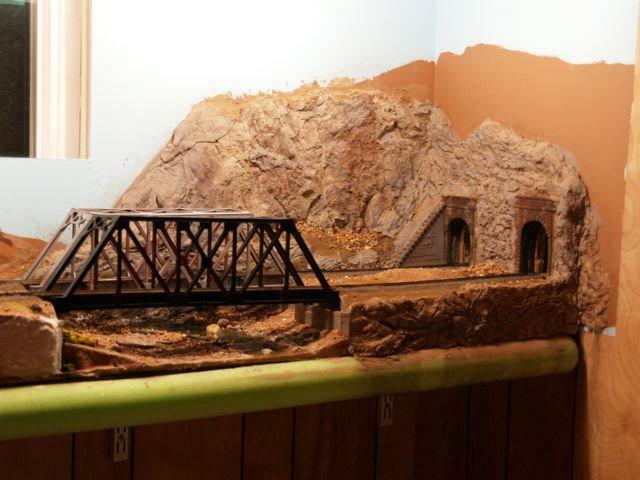 I painted the cloth with latex paint and sprinkled sifted dirt (Arizona Scenics) over the wet paint. 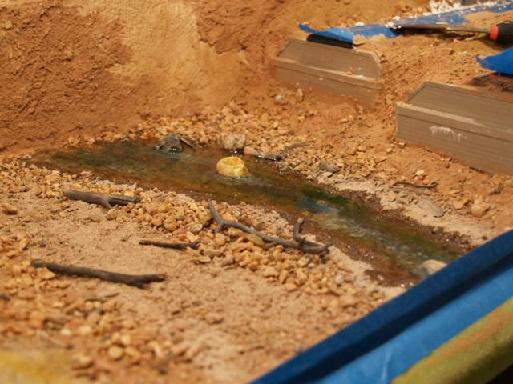 Then I filled in the stream bed with layers of sand of rock to form a channel for the stream. This is glued in place with scenic Cement. After that dried, I poured a stream made of Environtex. The water was colored with transparent paint made for coloring glass (Delta Ceramics). 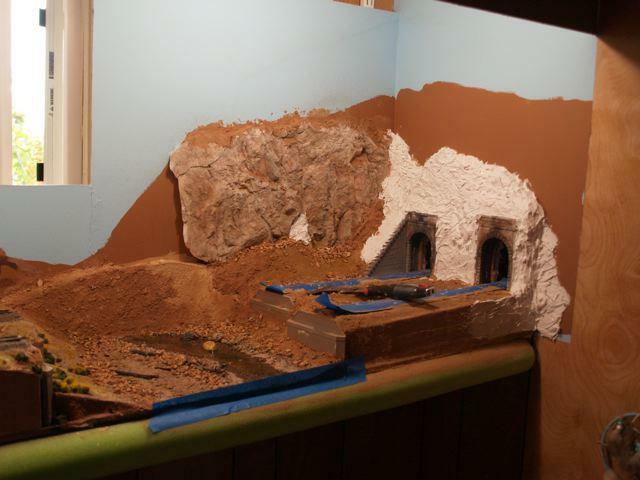 The rest of the rocks have been put in place using pre-mixed patching plaster. I used the tool to shape the soft plaster and to puts lots of grooves and cracks in the rocks while the plaster is soft. After it dries several hours, I then hand-carved the plaster, chipping and scoring it. Washes of colors, raw umber, burnt sieena and yellow ochre, are then used to color the rocks. The rocks have been painted and several black ink in water:alcohol washes have been applied to bring out detail in the rocks. The finishing touches are added. 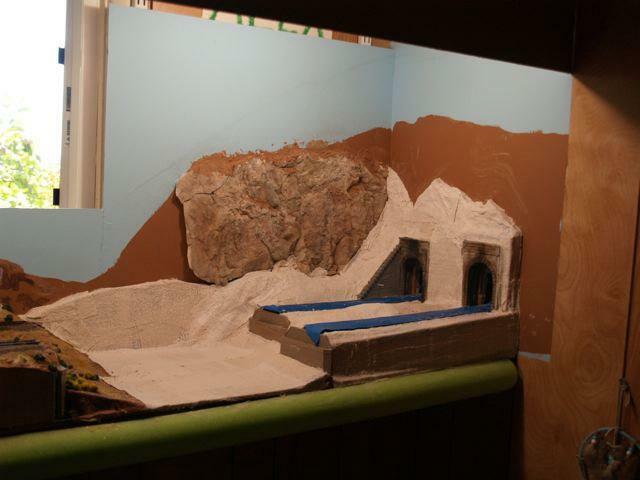 First I repaited the backdrop to make it blend better with the cliffs. I then added grass, bushes and the signals. I don't have any block detection on the layout so these signals are just lighted dummies that get their power from the track. One is always red and the other green. They serve to remind estbound engineers which track they should be on (the one with the green light). The other track is the Western Pacific track. The SP and the WP had parallel routes in this area and had joint trackage rights and operated the two mainlines together as if they were double track.